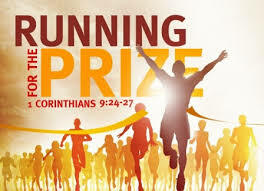 It is written in 1 Corinthians 9: 24 Do you not know that those who run in a race all run, but one receives the prize? Run in such a way that you may obtain it. 25 And everyone who competes for the prize is temperate in all things. Now they do it to obtain a perishable crown, but we for an imperishable crown. 26 Therefore I run thus: not with uncertainty. Thus I fight: not as one who beats the air. 27 But I discipline my body and bring it into subjection, lest, when I have preached to others, I myself should become disqualified. 10 Moreover, brethren, I do not want you to be unaware that all our fathers were under the cloud, all passed through the sea, 2 all were baptized into Moses in the cloud and in the sea, 3 all ate the same spiritual food, 4 and all drank the same spiritual drink. For they drank of that spiritual Rock that followed them, and that Rock was Christ. 5 But with most of them God was not well pleased. Thus far the text. Let us pray: Creator Father, who saves us not because of what we have done for you but rather because you give us faith through your Holy Spirited Word by grace through Jesus Christ our Savior; in the name of Jesus. Amen. Vince Lombardi coached the Green Bay Packers to several Super Bowl victories in the late 1960’s and early 1970’s. Mr. Lombardi had two sayings that stand out in light of today’s sermon text. He said, “Practice does not make perfect. Perfect practice makes perfect. Lombardi’s practices ruthlessly practiced the fundamentals. How to block. How to tackle. How to throw a ball. How to catch a ball. They had some fancy plays, but they only perfected the sweep and a few others. A second saying by Coach Lombardi is that ‘Winning isn’t everything. Winning is the only thing’. The two-minute warning was played as if it were the beginning of a new game. Vince Lombardi demanded his players play 110% until the game ending whistle was blown. Perfect practice makes perfect. And...Winning is the only thing. The apostle Paul is not a football coach. However, the apostle Paul does use sports illustrations encouraging us to stick with the fundamentals of the Christian faith. You do this as you continue to hear the Lord’s Word proclaimed. You continue to do this as you receive the Lord’s sacraments. 24 Do you not know that those who run in a race all run, but one receives the prize? Run in such a way that you may obtain it. Which means don’t give up. Your Christian life will have obstacles. You are promised by the Lord that you have a cross to bear. Just as runners get tired and want to quit the race so also Christians get tired of the cross and want to quit the faith. So Paul reminds us how even the great St. Paul runs in this Christian race writing, 26 Therefore I run thus: not with uncertainty. The apostle Paul also uses boxing illustration encouraging us to endure in this Christian faith until death. As it is written in Hebrews, 9:27 And as it is appointed for men to die once, but after this the judgment, 28 so Christ was offered once to bear the sins of many. To those who eagerly wait for Him He will appear a second time, apart from sin, for salvation. The outcome of your Christian race is guaranteed as long as you continue to practice the fundamentals which is believe in Jesus. And this faith in Jesus comes by hearing by the word of God (Romans 10:17). Continuing with the boxing illustration, Paul reminds us as to how he fights the Christian fight, saying: not as one who beats the air. 27 But I discipline my body and bring it into subjection, lest, when I have preached to others, I myself should become disqualified. Paul points out a few disturbing facts about our own spiritual fathers. What is to follow are historical facts about how good, Old Testament Christians gave up the faith. The apostle Paul writes, I do not want you to be unaware that all our fathers were under the cloud, all passed through the sea, 2 all were baptized into Moses in the cloud and in the sea, 3 all ate the same spiritual food, 4 and all drank the same spiritual drink. Let me step back a moment. It is easy to convince you that you are saved by Word and Sacrament. Another way to say that more broadly is that you are saved by faith through a promise and a sign. The Word is the promise. Bread and Wine are the sign but more than a sign when the promise is added. Now, whether you lived in the Old Testament or the New Testament, the Lord saves His people with the combination of a promise and a unique sign. One of Adam’s descendants will be the Savior who defeats sin, death, and the devil. A child is the sign. Until Noah, this promise and sign was all the people had to be saved by grace through faith in THE Child. That Child was not born until about 4,000 years later. 17 And behold, I Myself am bringing floodwaters on the earth, to destroy from under heaven all flesh in which is the breath of life; everything that is on the earth shall die. 18 But I will establish My covenant with you; and you shall go into the ark. Noah was saved by this promise of grace through faith. The accompanying sign is the ark. 10 Moreover, brethren, I do not want you to be unaware that all our fathers were under the cloud, all passed through the sea, 2 all were baptized into Moses in the cloud and in the sea, 3 all ate the same spiritual food, 4 and all drank the same spiritual drink. 21 Then Moses stretched out his hand over the sea; and the Lord caused the sea to go back by a strong east wind all that night, and made the sea into dry land, and the waters were divided. 22 So the children of Israel went into the midst of the sea on the dry ground, and the waters were a wall to them on their right hand and on their left. And you know the rest of the story. All the 600,000+ Israelites crossed the Red Sea safely. All the Egyptian army was destroyed when they tried to cross. These are our spiritual fathers. They had the promise and the sign. And yet, they did not continue in the Christian faith. When times got tough, they turned to unbelief. The Lord was not pleased. That whole generation that experienced the Exodus died in the desert. They had the promise and the sign just as you have the Word and Sacrament as the Lord has given to you. Yet our spiritual fathers died in unbelief. Paul is warning us not to be like them. Let us not give up the promise and sign of the Lord to us. Let us believe in Jesus and continue to hear the promise of salvation by grace. Let us to believe in Jesus and continue to eat and drink His sacrament for the forgiveness of our sins. This is how we practice the faith. Let us abide in Jesus the way He now promises through the means of grace; in the name of the Father and of the Son and of the Holy Spirit. Amen.